Gov. Andrew Cuomo says legalizing the adult use of recreational marijuana is among the agenda items for his coming new term. New York State already has legal medical marijuana, but some raise questions about how legal recreational pot may affect the integrity of the medicinal program. One of the local experts recruited to the governor's work group for crafting legal pot legislation, meanwhile, suggests very little is known about the substance many are in a hurry to make legal for casual consumption. Maya Valle lives with a very rare genetic mutation known as DYN-c1-H1 Deletion. It is so rare, that only about 50 cases are known worldwide. She is non-ambulatory, cannot communicate verbally and has multiple handicaps. 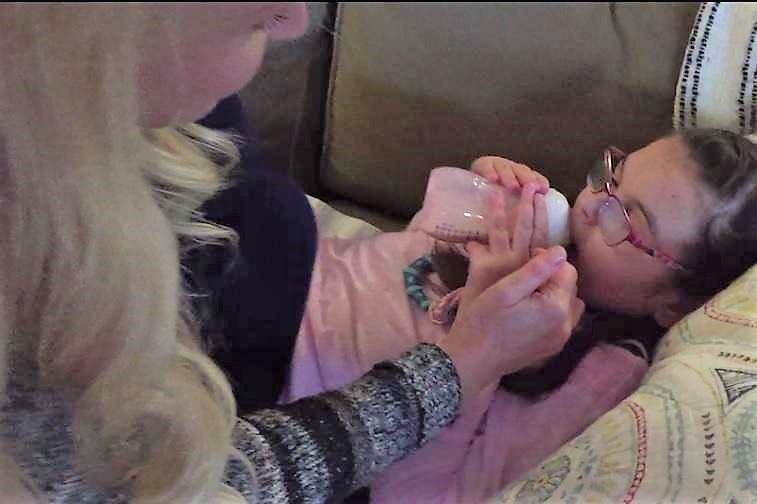 Lisa Valle administers a dose of medical marijuana to her daughter, Maya, who lives with a very rare genetic mutation which causes frequent seizures. Lisa says her daughter, upon switching to medical marijuana, has not had a known seizure since October 2014. "Her mutations causes her neurons to not function properly,"said Lisa Valle, Maya's mother. "She's missing a part of her neuron, which then the neurons don't multiply properly or sustain themselves properly." The condition also triggers frequent seizures, lasting about three to five seconds but occurring every three to five minutes. Lisa says her daughter was constantly agitated as the result of her frequent seizures. Further adding to her discomfort was neuropathy. Maya was estimated to have 150 to 300 seizures every day. "It was very hard to console her. Sometimes, just picking her up made her cry because she was in so much pain," Mrs. Valle said. In more recent years, she explained, she and her husband learned about medical cannabis and its potential to ease seizures. They decided to switch their daughter's combination of medications and give it a try. WBFO was invited to watch Lisa administer medical cannabis to Maya. She lay on a couch, clutching a bottle filled with milk. As she vigorously consumed the milk, her mother placed two oral syringes inside her mouth, one at a time. The first contained a CBD oil known as Haleigh’s Hope. The second was Columbia Care THC Tincture. Lisa recalled when Maya was first introduced to medical marijuana. "After we administered her first dose, you could see the tension on her face decrease, almost like it started melting away" she said. "My husband and I were like 'do you feel this is something different?' And it just continued." According to Lisa Valle, Maya was noticeably more alert, showed signs she was in less pain and suffered fewer seizures. She now takes medicinal marijuana three times per day. Maya's last known seizure, Lisa says, was in October 2014. Providing her daughter greater relief does not come cheap. Because the federal government still considers marijuana a schedule 1 drug, Valle's health insurance will not cover any portion of the expenses. Maya's CBD is ordered and shopped from Colorado, where the price is a fraction of what Lisa says they would pay in New York State. 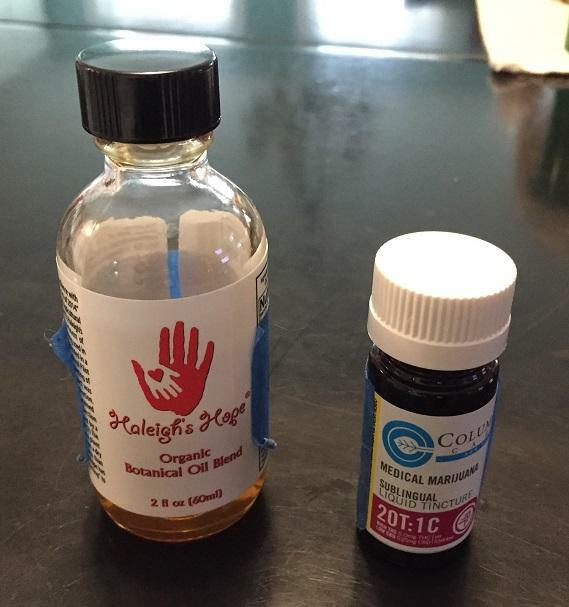 Haleigh's Hope CBD oil, left, and Columbia Care THC Tincture make up the combination of medical marijuana products Maya Valle receives three times per day. "If I bought everything in-state, my monthly cost would be about $1,800," she said. "Buying the CBD oil from Colorado saves me about a thousand dollars. Between the two products I spend about $300 a month." New York State enacted the Compassionate Care Act in 2014, which made medical marijuana a possibility for a very limited number of patients. Albany then introduced its medical marijuana program in 2016. It is now considering the legalization of recreational marijuana for adults. Some question whether gaining access to the recreational form of cannabis might be though of as an alternative to the state's medical program. One of the experts recruited last August to join Governor Andrew Cuomo's work group for crafting marijuana legislation says cannabis is a complicated drug. "We do not know a lot about the health benefits and harms of cannabis because we are very much behind in conducting research," said Dr. R. Lorraine Collins, professor and associate dean for research for the University at Buffalo's School for Public Health and Health Professions. "To some extent what has happened is that some of the ideas about the health effects have come out of people's experiences, out of case studies, but they have not been corroborated by science." Dr. Collins suggests even New York's medical marijuana program was advanced without an adequate level of research. Medical marijuana as a whole, she suggests, became legal in parts of the United States not because there was science readily available to back it but because activists, beginning in California, simply generated enough support to make the issue a public referendum. "Based on this advocacy about perceived medical benefits, we then kind of had continued advocacy that basically said 'well, if it's a medicine, it's not harmful, therefore we can have recreational cannabis,'" Dr. Collins said. Scientists say brain development continues until about the age of 25 and, thus, if recreational marijuana were to become legal for adults, it might still pose threats to brain development even among young adults. As Dr. Collins puts it, "the train has left the station" in terms of pushing for legal marijuana. New York State will be playing catch-up, in her mind, with research of benefits and hazards. There's also the question of who conducts the research. The tobacco industry's largest companies have already bought into legal marijuana but that raises concerns about the credibility of the research. Will there be a risk of skewed or misrepresented findings, as the industry fostered with tobacco research? "There's a lot of integrity and there's a lot of scientific oversight of the research that's being done in academic settings," she told WBFO. "We always have to be careful. That's why you have peer review, so that we understand that not only the researcher has confidence in the finding but that others can look at those findings, or look a the data, and replicate them or verify them." Lisa Valle recognizes some possible benefits of legal recreational marijuana, including a new tax revenue source and less incentive to buy pot from the black market. But she also sees a potential to decrease the respect for medical cannabis. "It takes away from the medical piece," she told WBFO. "It becomes this grey area of who's just using weed and who's using it medicinally, then all of a sudden everyone's using it medicinally." She defends the medicinal marijuana program, saying there's a difference in the attitudes of those who use it. "I think it is a big misconception that people think it's just stoners who want an excuse to get high, so they want to use medical marijuana. Most people who use medical marijuana dose themselves at a threshhold where they don't feel psychoactive," she said. "Or, they may take a heavy dose of psychoactive at night right before they go to sleep, so that they sleep through that part, and then during the day they take more of a CBD base so that they can function during the day." She has seen the difference in her daughter. "She's more alert. She's happy," Lisa Valle said about Maya. "She's looking for people. She's looking for interactions from people, instead of just existing. That's pretty much how she was before."